I usually drink coffee black, but there are lots of drinks – tasty drinks, I might add – out there that are worth changing things up for every now and then. 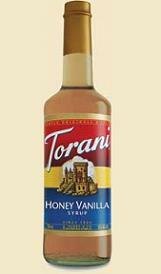 I prefer to make my own sweetened syrups for coffee when I can, but sometimes the big syrup companies come up with some unusual flavor combinations that I can’t pass by without trying.Torani’s Honey Vanilla Syrup is one of these. It’s a new, seasonal offering from the company and it’s already one of their best sellers. The syrup definitely lives up to it’s name. It is sweet, surprisingly thick and with a really natural tasting floral honey flavor. The vanilla is an undertone and, again, tastes very natural. It works well with the honey. The honey flavor does come out well in a finished drink, even over a fairly dark coffee. It makes a great, slightly unusual latte and is delicious in just about all types of tea where the honey can really shine.